A grilled halloumi cheese recipe, marinated in a spiced basil chili oil and finished off with maple syrup to give it an extra layer of flavour that makes that squeaky grilled cheese even more satisfying than before! 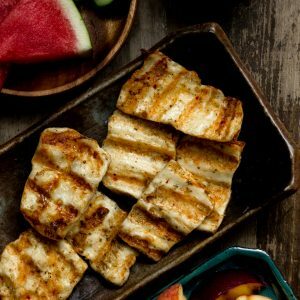 Grilled halloumi cheese around here usually means the weather is warm and we’re serving these up as appetizers or snacks to our friends and family who are visiting. These are great because they are bite-sized, easy to eat and super addictive. 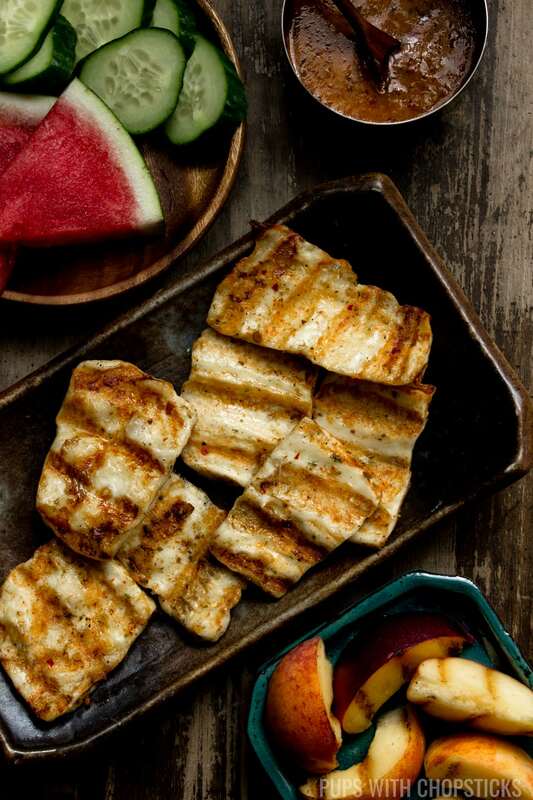 For this grilled halloumi recipe, all ingredients can be found at your local grocery store. What Type of Basil Do I Use? For this recipe, any type of basil works. 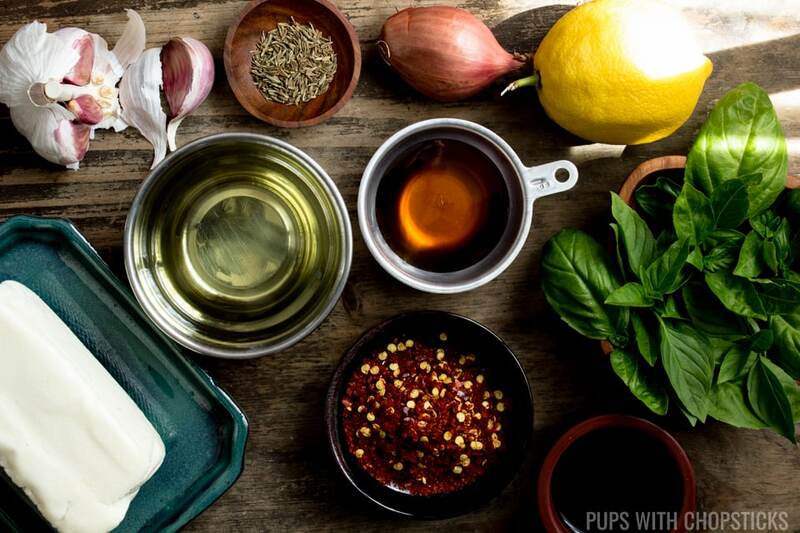 I have used Italian basil and Thai basil and both equally give the marinade an amazing aroma and flavor. Crushed chili flakes are optional, so if you don’t want any heat to it – you can just omit the chili flakes or add a little bit. How Long Do I Marinade The Cheese For? Fire Up The Grill and Oil Your Grates! These don’t take long to make and don’t worry they won’t melt away into goop as well. I usually like firing up the grill to about 400F – 450F (204C) and cooking it for approximately 2-4 minutes a side or until I see brown grill marks. 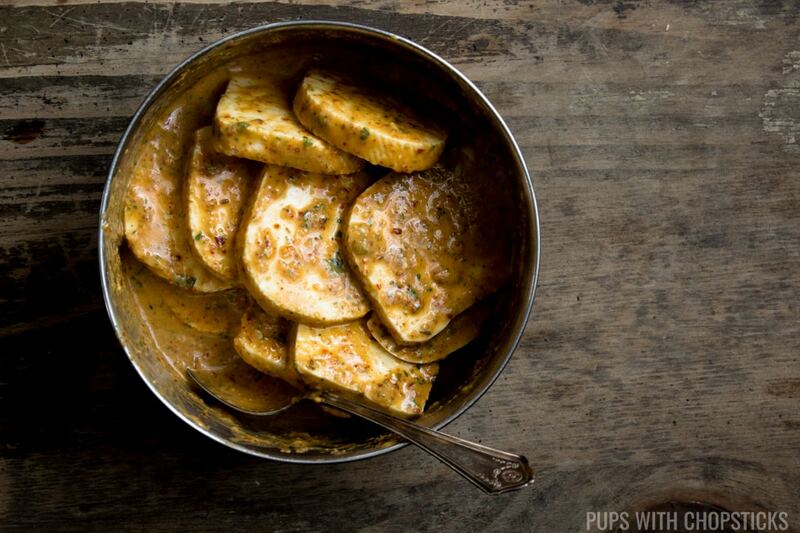 To prevent the halloumi cheese from sticking onto the grill grates, make sure you oil and season it very well. I also find that using a metal spatula to gently scrape the grill under the cheese to loosen it before flipping it, helps keep the crispy part intact with the cheese. 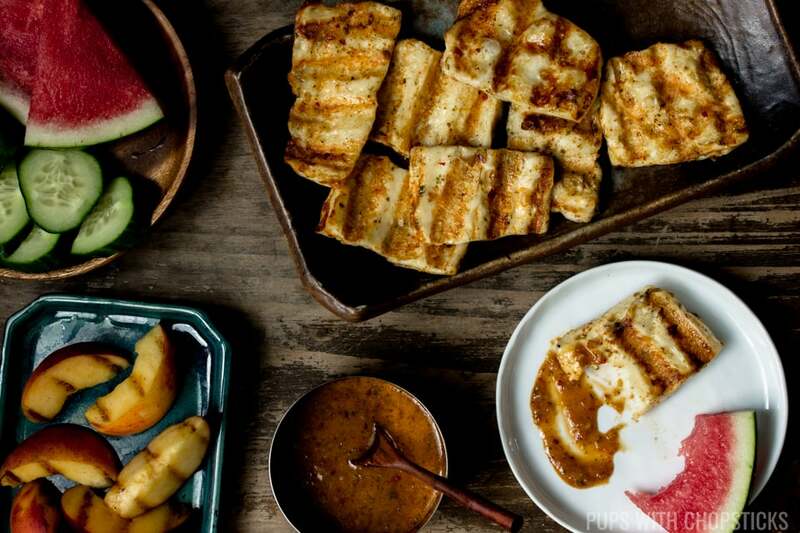 Save Some Marinade As a Dipping Sauce or Drizzle! If you have any leftover marinade in the bowl, save it as a dipping sauce! Using a saucepan, add the leftover marinade, 1 tablespoon of oil to thin it out a bit and 1 tablespoon of maple syrup to add a touch of sweetness and cook it on low heat for 3-4 minutes and serve it with the cheese to give it a bit of sweetness. 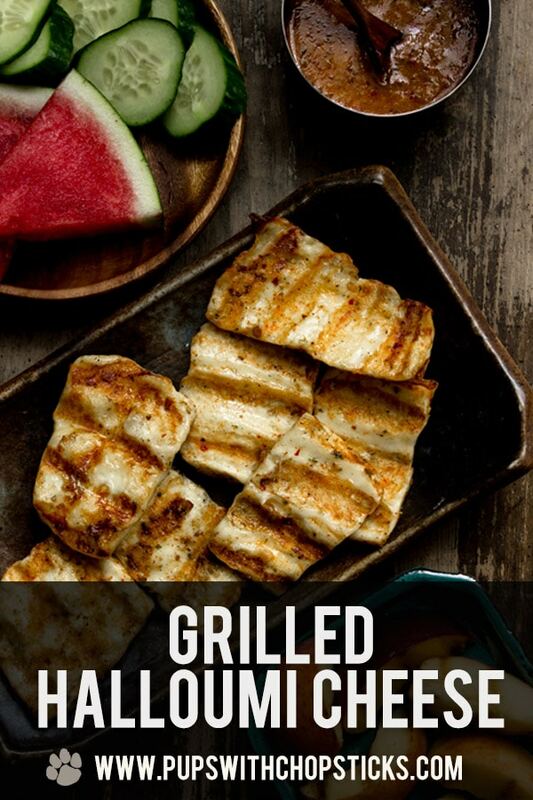 What Do I Serve Grilled Halloumi With? Since the cheese can be quite salty, I like to usually pair it up with something sweet and refreshing or something tart. Slices the halloumi cheese 1 cm thick. Put it in a bowl and set aside. Pour the marinade over the sliced cheese and gentle coat so they are all evenly coated. Marinade for a minimum of 15 minutes. Set the grill to 400F-450F and oil the grates well. In a small sauce pan, add the leftover marinade, 1 tablespoon of oil and 1 tablespoon of maple syrup and cook over low heat for 3-4 minutes until it is hot. The cheese may stick to the BBQ grate. I find it was easiest using a metal spatula to gently scrape below the cheese to loose it up gently before flipping it. My younger kid loves to eat this Grilled Halloumi Cheese, he said the cheese tasted so yummy yummy. Even asked to pack some to school for lunch.